The Columbia Model 100-P High Intensity Acoustic Sensor (Microphone) is designed for measuring exceptionally wide pressure ranges in applications requiring fast rise times and broad frequency response. 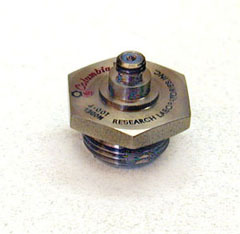 This sensor is extremely sensitive allowing very low pressure measurements to 0.005 psi as well as high pressure transient measurements to 5,000 psi at temperatures up to +150 Degrees C.
The Model 100-P sensor is small, lightweight and very ruggedly constructed with a stainless steel case, O-ring seal and flush diaphragm. Its small size, broad frequency response and low cost designates this unit an excellent choice for a wide range of applications. Consult the factory for customized versions of this sensor.